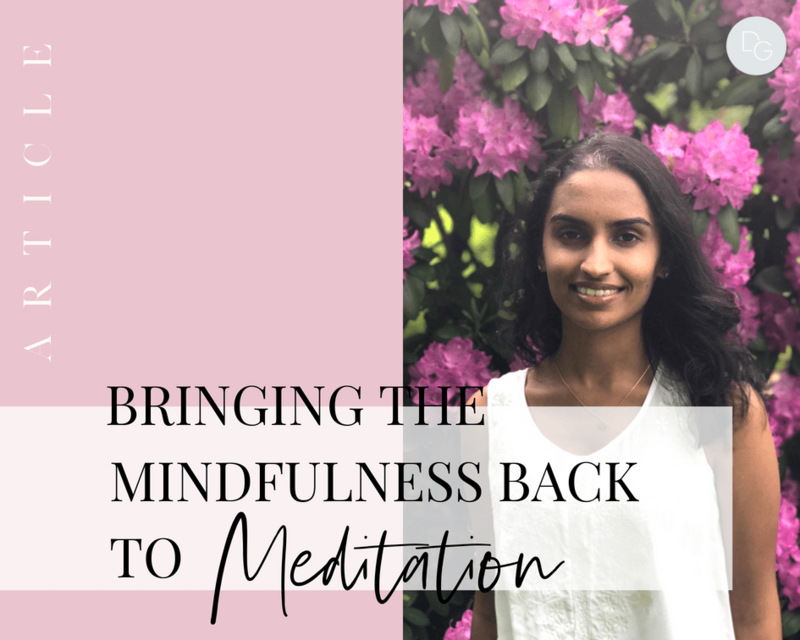 We want to connect with our intuition, balance our hormones and destress – so we embark on a quest to learn meditation. We find a teacher, read some books and attempt to follow the “rules”. Mindfulness is a quality we can easily lose sight of. Our practice becomes a part of our checklist rather than a ritual. We overlook our intentions. We might judge our practice for being inconsistent, or for “not working”. Here’s are 8 ways to bring the mindfulness back to your meditation practice. When we embark on this path, we often think that we need various teachers, books and podcasts to learn the “right” way. Don’t forget to listen to your own wisdom. Is your back hurting in the pose you’re in? Do you need to try to keep your eyes open or experiment with a walking meditation? There are endless ways to practice so trust what your intuition guides you toward. Instead of pondering over whether your meditation was fruitful, and whether you did it correctly, know that you are practicing and not perfecting. Practice to learn and grow, not to attain and achieve. Let go of the doubts. Release self-judgment and criticism, and cultivate compassion towards your practice. Know that you’re just as capable to meditate as anyone else. Conscious spiritual practice is about tuning into our needs and adapting to what we need. It’s not about a routine or a strict discipline that can easily become robotic. While discipline can help us get to know a practice and see results, it’s often taken too far. We don’t have to have the same spiritual rituals day in-and-out. Allow your practice to change as you change. Experiment with different styles of meditation. Allow yourself to make mistakes, wander off path, and also come back to your meditation. Forgive yourself for any thoughts and feelings that may have come up and know that they are coming up for your growth. Forgive yourself over and over again. It’s okay for you to have thoughts during meditation. It’s also okay for you to get caught up with life and leave your practice behind at times. Forgive yourself and gift yourself a new start. Thank yourself each and every day, whether you’re practicing for the first time ever or whether you’ve been practicing for years, for showing up for your evolvement. Thank yourself for healing your wounds so those around you can heal too. Say thank you to your teachers. Thank the circumstances and experiences that led you to this practice. Thank yourself for uplifting the collective consciousness. Meditation is no longer a mindful practice when it’s done with the intention to cross something off our to-do list. It’s also not mindful when we’re decided on attaining a fixed outcome, which we consider a success if attained, such as better sleep or a quiet mind. Practice with the intention to explore your consciousness. When we begin meditating, we often think that we need to buy the bells and whistles. Know that you only need your awareness, breathe and intention to meditate. Let go of the aesthetics and materialistic things that aren’t rooted in consciousness. Buy your crystals to get to know their energy, and props to support your body, but don’t collect these items for your identity. Don’t delay your practice for these belongings. Your practice is also not any more valid or successful with them. Practice to know yourself better. Ask yourself, “What does my body need today? What feeling am I holding in my heart? Where is my breath stuck?”. You can only hear the answers for the questions you ask. The qualities with which we practice – gratefulness, compassion, forgiveness, curiosity, loving-kindness, self-awareness – are just as important to our practice as our teachers and books. Meditation is no longer just a tool for better health or a part of our routine. It’s a sacred practice that we can bring mindfulness to in a variety of different ways.